A bit of a stroll down memory lane for me, as it were. First, the Bradley’s been in service since about 1982. 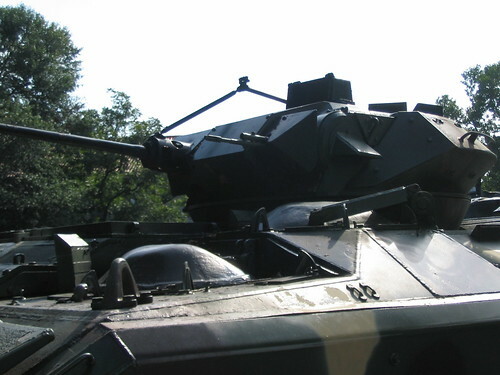 Main production variants of the Infantry Fighting Vehicle version include the M2*, M2A1, M2A2-ODS**, and the M2A3. I’ve never seen an M2A3, but I’ve dealt with all the other models. Oddly, I mostly went backwards. I was loaned out to a unit for Desert Storm, and it was equipped with brand new M2A2 vehicles. Months later, I was assigned to a unit in Colorado that was equipped with M2A1 models. And when that unit went to the National Training Center, we drew vehicles there for our rotation from the common pool rather than bringing our own. Those vehicles were vanilla, early production M2s. Eventually, I got to spend just a bit of time on an M2A2-ODS at Ft. Benning. Esli had this to say about reloading the main gun on a Bradley. It’s easy but not too fast. You have to traverse the turret, pop off some covers to give the guys in back access. Then, the guys in back have to move all the gear that is stacked up all over the floor, raise the floor panels and pull long cans with multiple straps around them up. Then open the long cans, which are covered in a thick sheath. Then feed belts of AP or HE into the ready boxes, reorganize the rear stowage and reinstall the covers and then traverse the turret back. (What our host may not know is that an upgrade to the rear of the track changed the 25mm stowage to this new system.) I made all my infantry crews practice this. By the way, no static Bradley begins to convey how cramped they are when loaded up with nine guys and all their gear. Particularly cramped in the turret. Youtube has all kinds of neat Bradley videos (see below) but apparently none showing the loading of the ammo cans. 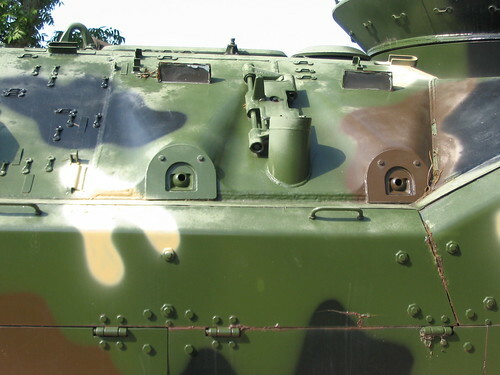 The ammo cans for the Bradley are the the front of the turret, beneath the gun mount itself, right about where the gunner and commander’s shins are. You may recall that the M242 25mm gun fires two types of ammunition, Armor Piercing (AP)*** and High Explosive Incendiary (HE). Both types of ammunition are carried simultaneously, and the gun can switch from one type of ammo to the other simply by pressing a button on the gun control panel. Here’s an oddity. The next round fired after changing the selection will be of the previously selected ammo- that is, if you fire a burst of AP, then switch to HE, your next shot will be AP before the HE starts loading and shooting. AP and HE have very visibly different ballistic trajectories, and it is quite disconcerting at first to see the first round of a burst fly off on a path well away from where the reticle in the Gunner’s Sight Unit would lead you to expect. The ammo cans, in spite of being right in front of the turret crew, cannot be accessed from inside the turret. There are two cans. One holds 230 rounds of ammo, and the other holds 70 rounds. The “normal” load is 230 rounds of HE, and the smaller can with 70 rounds of AP. Both kinds of ammo used to come in boxes that hold two 15 round linked belts of ammo. The boxes are sized to fit under the floorboards of the troop compartment, filling the space between the hull and the floorboards. The new ammo storage is supposed to be easier and more ergonomic. Don’t bet on it. Now the crew pulls ammo out of the cans, and loads them into “hot boxes” under the floorboards in 50 round belts for “ease” of loading. Here’s what the back of the vehicle looks like. You can see the pop-up floorboards more clearly here. Actually the interior of the troop compartment of a Cavalry M3. The M2 has bench seating on both sides of the compartment. You can also see the turret basket and some of the interior of the turret itself. The shielding around the turret does not rotate. There’s a sliding door that is normally closed when operating the turret for safety. The belts of ammo don’t just rest in the bottom of the turret ammo cans. Instead, there are flanges on each link of the ammo belt that are used to hang the ammo along side rails at the top of the ammo can. Loops of about 25 rounds hang in the can. Dummy 25mm ammo. The flanges are at the top and bottom of the link. Actually, in one can, the ammo goes under the top rails, and on the other, the ammo is “upside down” with the links on the bottom, so one round of the ammo itself rides along the top of the rails inside the can. Sound confusing? It is. Who knew simply loading ammo in a can would involved having to count exactly how many rounds were being looped in. From FM 23-1 Bradley Gunnery. I’ve tried to find a decent picture of the actual loading setup, but my google fu failed me. Note that the cans load from the side. The gunner has to spin the turret to align first one can, then the other with the turret shield door (and engage the turret lock, and turn off the turret drive motor for safety) before loading can actually begin. If the cans are partly filled, the counting process still has to occur, and the loader just hangs the ammo. But if the cans are completely empty, the gunner has to use a ratchet wrench to drive a pawl that feeds the ammo up the feed chutes to the gun’s feeder, and go through the hassle of actually feeding both types of ammo into the feeder and cycling the ghost round. If you really want to learn about that, which I’ve mostly forgotten, feel free to consult FM 23-1 yourself, embedded below. Enough of this. As noted, the Bradley entered service in 1982. Here’s a contemporary video released by FMC, the manufacturer, about that time. There’s some good shooty and splodey in it. 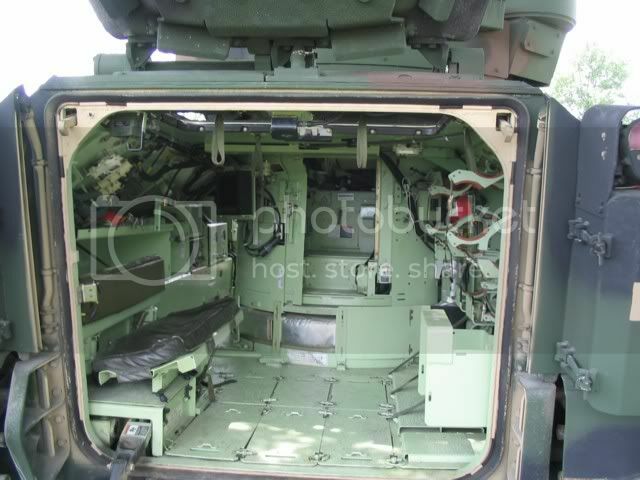 It also shows loading the TOW missile launcher from the troop compartment via the top hatch over the troop compartment. m. Today, they’re virtually never used. In fact, M2A2 models and later blanked over the ports on the sides of the vehicle, leaving only the two on the rear ramp. The “bible” for shooting the Bradley, and training crews was, as noted above, FM 23-1 Bradley Gunnery. Far more than the mechanical aspects, it discusses armored vehicle gunnery techniques in general, as well as platoon fire distribution and some other good stuff. Like, you know it is legal under the laws of war to shoot paratroops hanging in their chutes, but not aircrew escaping from a downed aircraft? I used to have this manual virtually memorized. Now… not so much. *Often referred to as M2A0 to differentiate from the more generic “M2” designation. **ODS- Operation Desert Storm. A series of improvements derived from lessons learned and suggestions from the field, mostly concerning internal rearrangements and addition of a laser range finder. ***Actually, Armor Piercing Fin Stabilized Discarding Sabot- Tracer, or APFSDS-T. Similarly the High Explosive has an incendiary component and also a tracer element, and is more properly HEI-T. In common usage and in fire commands, they’re simply referred to as AP or HE. The familiar Bradley Infantry Fighting Vehicle had a long and somewhat troubled design history (what weapon system hasn’t???). After several M-113 derivatives and other considerations, the Army asked FMC Corporation for something competitive with the Soviet BMP vehicles. The first prototypes, named XM-723 appeared in 1973. 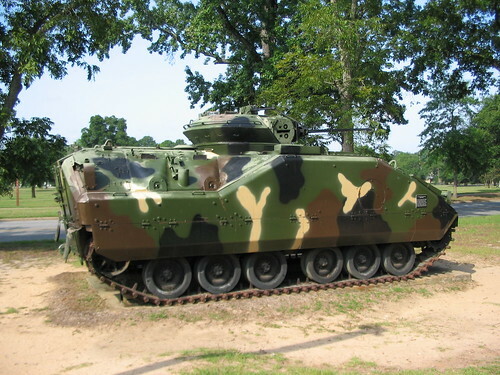 One of those prototypes on display at the Infantry Museum at Fort Benning (these were taken before the museum relocated). Note the port firing weapon stations on the side. Here’s a close up view. This early prototype lacks the TOW launcher found on later prototypes and of course the production M-2/3 Bradleys. I cannot confirm, but the turret may be an early “one man” version with a main gun and coax machine-gun. The gun may be either a 20mm or early 25mm (Forgive me for not climbing up and measuring the bore!). The TOW addition was somewhat a reaction to reports from the Middle East wars, where anti-tank missiles had performed well. So well that some were calling into question the dominance of the main battle tank at the time. Almost every army you look at is ahead of the American Army, as far as taking care of our infantry. The Russians, are ahead of us, the German, are ahead of us, the Dutch are ahead of us, the French are ahead of us, the Yugoslavians are ahead of us. Almost everybody has a better infantry vehicle than the U.S. Army. We would have been better off in 1963 when we started to just build the MICV immediately. Are we to start over again? My guess is that if you start over again, you will have a 10 percent increase in effectiveness and 50 percent increase in cost. Bradley development continued over anther five years after General DePuy made that statement. Weapon development is not a simple, linear process. Still, a “good” weapon in the hands of excellently trained troops today will trump the “perfect” weapon delivered after the shooting is over. Nothing like a little ‘splodey to start the day. Sadr City is one of the infamous slums of Baghdad. Back in my day, the Army had no realistic doctrine for fighting in cities. We paid a little lip service to it, but in reality, tried very hard to avoid it. Heavy units- mech infantry, and armor, especially tried hard to avoid combat in close terrain like cities. In 7 years in mech units, I never once trained in a built up area. Reality, however, has a tendency to intrude upon fantasy. The fact is, much of the terrain worth fighting for in large parts of the world in in the cities. American forces fighting in Baghdad and other Iraqi cities quickly learned to adapt the barebones doctrine that existed to the reality on the ground. They used the massive firepower available to them to minimize exposure to enemy fires. They quickly learned how to minimize exposure to enemy anti-armor weapons. And they learned how to integrate the fires of heavy weapons and air support with the agility of dismounted troops. There’s a huge pool of US troops that are extremely well versed in this most difficult of fighting- city fighting. I got nuttin’ today (so far! ), so I thought I’d just post some pics. A lot of attention has been paid to the threat IEDs and EFPs pose to Humvees in Iraq and Afghanistan. Heavier armor, jamming of cell phone signals, the CROWS weapons mount and “Rhino” countermeasures have all worked to make Humvees more survivable in an IED environment. Also, moving from Humvees to MRAPs for some missions has increased troop survivability. Still, IEDs aren’t the only threat Humvees and similar vehicles face. One of the most common weapons on the battlefield is the RPG, or Rocket Propelled Grenade. An RPG is a pretty simple weapon. It’s basically a HEAT warhead with a rocket motor to push it along, all fired from a simple tube. Our guys use a similar weapon, the AT-4, which is a disposable, one shot weapon. The RPG is reloadable. The RPG is a real threat to light vehicles like Humvees, MRAPs, and even Strykers and Bradleys. Its HEAT warhead can penetrate the armor of just about any armored vehicle short of a main battle tank like the M-1. An RPG hit on a Humvee will often result in death or injury to the entire crew and a catastrophic loss of the vehicle. So how do you defend a vehicle like the Humvee from RPGs? They are too small to carry explosive reactive armor or an anti-RPG cage. You can’t keep adding additional armor. The chassis just won’t take that much weight. Well, for a couple decades, the armies of the world have been exploring “active defense” against RPGs (and similar HEAT warheads). Using a radar sensor to detect an incoming round, the active defense would instantly and automatically react to fire a projectile to impact with the warhead. Two big problems have always existed with this. One, the sensors and controls just haven’t been practical until the recent improvements in electronics. Secondly, having a vehicle that routinely has troops (and innocent bystanders) nearby suddenly start shooting off explosives is kinda unsafe. Recently, Artis LLC, in conjunction with the Defense Advanced Research Projects Agency (DARPA) came up with a system called Iron Curtain that uses a combination of advanced sensors, downward firing countermeasures, and special explosives and projectiles to field a system that can defeat RPG rounds without posing a great risk to dismounted personnel. The system probably won’t be ready for service for another year or so, but can potentially be a great aid in saving the lives of troops. No real point to it, just liked the video and thought I’d share. It’s rare to see training footage using service ammo. We love posting YouTube videos. Mostly because it is easier than writing, but also because the truth about a picture being worth a thousand words. By far the funnest, and most rewarding job I had in the Army was as a Bradley Commander. While life wasn’t exactly like the video (somehow, the videos don’t spend a lot of time showing Brads on the washrack in the winter…), it had its moments. I had a couple pleasant flashbacks to fun on the range and out in the boonies. We’ll be out of town the next day or two, so no posting. Sorry. In the interim, here’s a little something to tide you over. Our best tour in the Army was in the 4th Infantry Division, rising to the position of a section leader for a section of two Bradleys. In garrison, we were responsible for the crews, training, and maintenance of both vehicles. In the field, the Platoon Leader took command of the other Bradley, and we worked as his wingman. Here’s a good look at some of the firepower and mobility of a Bradley. Lots of nice shots of the 25mm and the TOW missile system. There’s some obvious Iraq footage, and some from operational units, but a lot of the footage seems to come from the 29th Infantry at Ft. Benning. The 29th is the demonstration unit at the Infantry School. They provide the vehicles for basic training for infantrymen, and troops for young infantry officers at school to practice with. They also periodically provide firepower demonstrations to VIPs to show what the taxpayers are getting for their money. Just a quick vid of what Bradley gunnery looked like in the winter of 2002 in Germany. I found this via a troop’s myspace page. Here’s a little more “Boom” for you. It’s a mashup of some footage from Iraq. Most of this looks to be from 2004 or early 2005. There’s some small arms, Bradleys, TOWs, Javelins, AT-4s and 500lb bombs. Interestingly, there’s a brief bit of Blackwater MD530 helicopters.